When the first satellites began launching a half century ago, they were quite small. Sputnik at just 58cm/23in in diameter, had a single purpose: to send a radio signal that proved it existed. Over the decades that followed the demands placed on satellites increased, which led them to grow in size. As they got bigger the cost of launching them grew too. A revolution in the miniaturisation of satellites began at the start of the 21st century. Commonly known as cubesats, these small satellites start at 10cm cubed in size, weighing approximately 1kg, or a little over half a pound. Manufactured from off-the-shelf parts, cubesats are cheap enough that multiple copies can be launched to reduce the risk of failure. Getting cubesats into space usually involves packing them into spare capacity when launching a larger, conventional satellite. With the rapidly increasing capabilities of modern mini-satellites, demand for cubesat launch capacity is rising. During the week NASA put out a request for innovative methods to get cubesats into space cheaply, without tacking them on to an existing launch. NASA might want to speak to DARPA, who will soon be trialling launching small satellites from the belly of a fighter jet. Once in orbit, it would useful to be able to move cubesats around. Adding a propulsion system and fuel can drastically increase the weight and cost, which defeats the purpose of using a small, cheap satellite. The latest flight of the US Airforce’s normally secretive X-37B is carrying 10 cubesats, one of which is sporting a solar sail. The sail is 32 sq. meters/344 sq. feet in size, which would be enough for it to manoeuvre in orbit. Unfortunately the X-37B isn’t going to be high enough that the satellite can escape atmospheric drag, so it’s expected that it will soon fall back to Earth. Another promising alternative for micro-satellite propulsion was announced during the week. Also using light, Y.K. Bae Corporation revealed a Photonic Laser Thruster (PLT) was successfully able to accelerate a half kilo/1 lb object along a frictionless track. 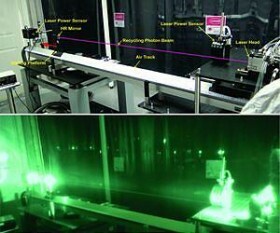 The idea is that an intense laser beam can be directed onto a mirror on a micro-satellite, which could be used to propel it. The equipment to produce the laser is too large to be included on the satellite, so the beam would have to come from an external source. The benefit of this system is that there is no fuel needed on the micro-satellite. Perhaps the only extra requirements would be a couple of mirrors and a control system to move. The other requirement is a steady aim for whoever is shooting the laser. Does NASA Have a Robotics Strategy? What Will the X-37B Military Space Plane Do? What Makes Mars Sunsets Different from Earths?